Bastia is a large town to the north-east of Corsica and on the south-eastern side of Cap Corse, the peninsula to the north of the island. 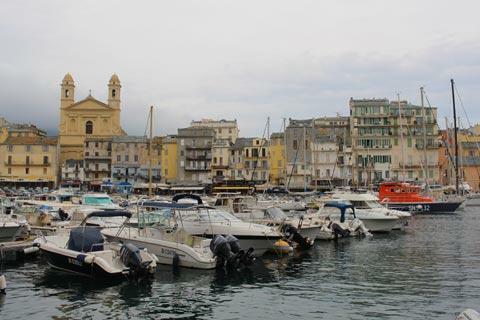 The town is the principal port and commercial centre for Corsica. 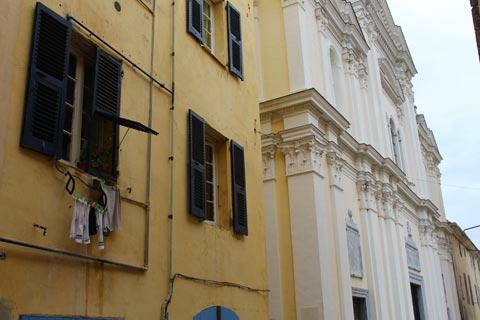 As with many Corsican towns, the history of Bastia starts with the Genoese who controlled the island from the 14th century, although later centuries have also left their mark - in particular from the baroque era to the 19th century when a great deal of development took place in the town. 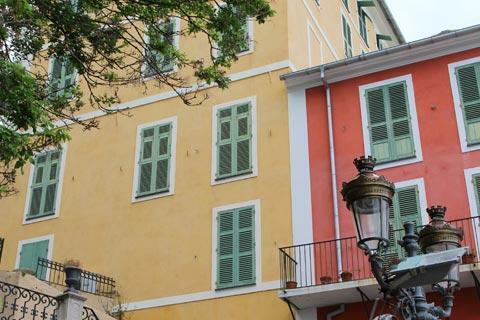 Because of this important heritage Bastia is listed as a Town of Art and History in France. 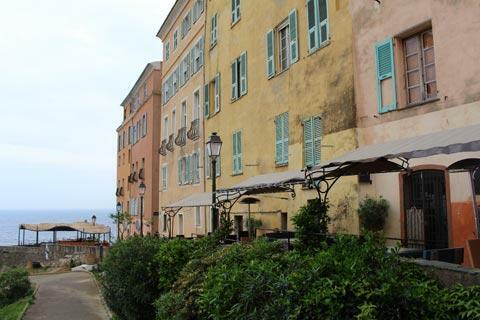 Broadly speaking, Bastia has an old port in the town centre with the citadel and old town on a hill above the port, and 19th century boulevards and squares to the north of the port. 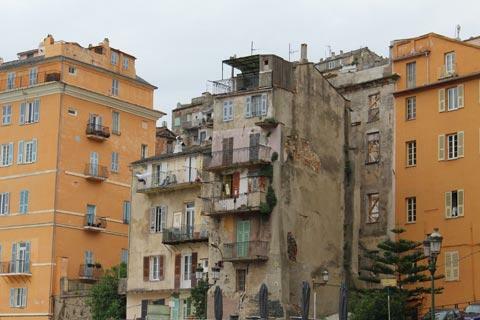 The Old Port (Vieux Port) at the south of the town is the best place to start a visit, with a stroll around the harbour to see the jaded buildings, almost reminiscent of those we might see in Venice, clustered around the fishing and pleasure port. You will also find several restaurants around the harbour so it is a pleasant place to stop for lunch. There is a newer commercial port to the north of here which is now used for more industrial trade and commercial passenger boats so the old port is only for smaller vessels. France This Way comment: one day in the future when the houses around the harbour have all been renovated and painted bright colours it will be among the most beautiful in France...but as you will se as you explore Bastia there are quite a lot of buildings in need of renovation and it all costs money! On the south side of the harbour you can pass through the Romieu garden to reach the citadel above the port. 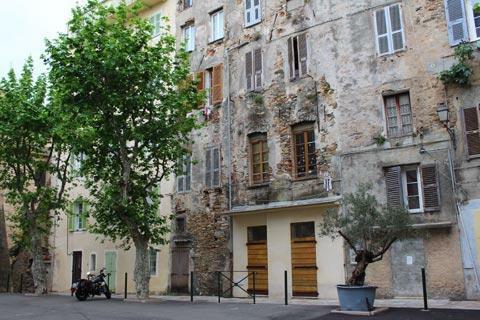 This is the original genoese town that is protected by defensive walls added during the 15th century, including the Porte Louis XVI through which you enter the citadel, and contains most of the interesting historic monuments in Bastia. 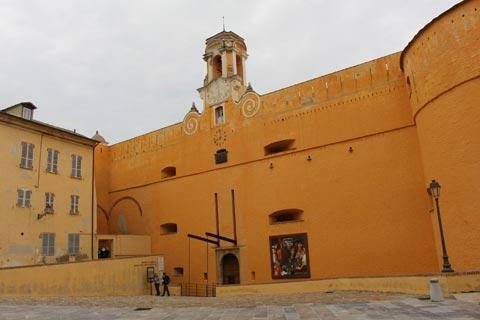 The Governors Palace was added soon after, and built around a tower that is one of the oldest parts of the citadel. The early palace was transformed over the following centuries, and by the 16th century had become the grand building we see today below the walls of the citadel. 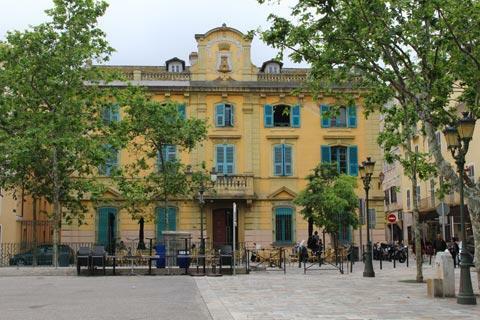 The palace now contains the Corsica Museum of Ethnology. 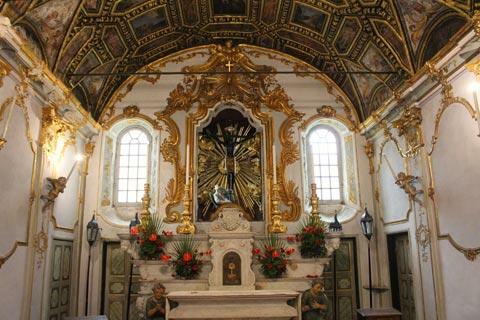 The main church in the citadel is the Cathedral Santa-Marie de l'Assomption, built it 1619. Next take the small road to the side of the cathedral to reach the Oratory Sainte-Croix, a lovely small baroque chapel built around 1600 and containing a statue of Black Christ: the oratory is the more intimate and interesting of these two religious monuments, in my opinion. After exploring the citadel you can amble through the warren of streets of the Terra Vecchia region behind the harbour admiring the crumbling facades of the medieval buildings. As you approach the Church of St-Jean-Baptiste the streets get ever narrower and the tenement blocks ever higher in this, the oldest part of the town. The Terra Nova is the more recent part of town. 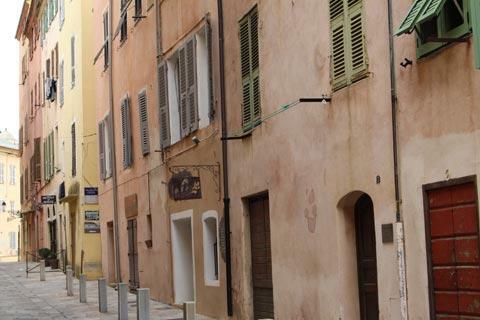 Wider boulevards will satisfy your needs for shopping and light, and the newer part of the town also includes a large number of impressive buildings constructed in Bastia during the 19th century such as the classical style Theatre and the Palace of Justice. 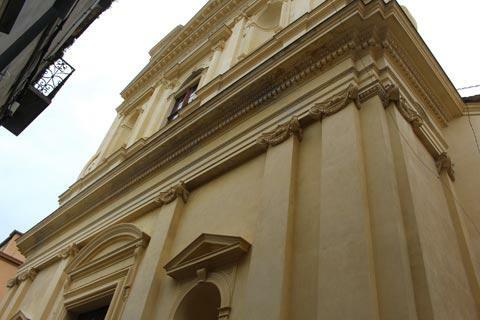 The architecture of the 16th to 18th centuries in Bastia is also to be seen in the numerous churches and chapels in the town, many of which have interesting facades. 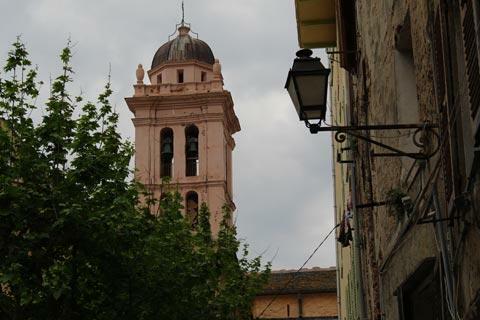 Typically these churches are in the baroque style, for example the Church of Saint Charles-Borromée, or the neo-classical style such as the Church of Saint John the Baptist. 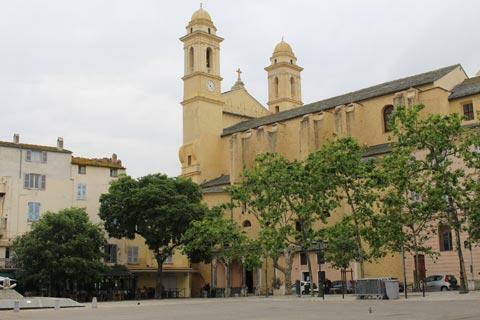 This church is the largest church in Corsica, but note that the two belltowers which overlook the old port were added later, in the 19th century. Behind the Church of Saint John the Baptist the Place du Marché is an attractive square with lots of trees providing shade and a selection of restaurants (there is also a car park underneath the square if you are staying nearby) as well as some imposing 19th century townhouses. North of here the spacious Place St-Nicolas also has various cafes and views across the sea, and a large statue of Napoleon as well as another subterranean car park, although its large size and the number of cars make this square less inviting than the Place du Marché. 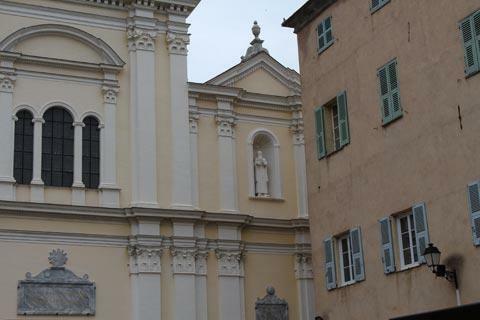 A small tourist train starts its tour in the Place St Nicholas and spends 45 minutes passing by the main sights in Bastia. The main weekly markets are held in central Bastia in the Place du Marché each saturday and sunday, with smaller markets in the same square on other days. There is a flea market in the Place Saint Nicholas each sunday. To the west of the Place du Marché and the Place de la Republique are the principal 19th century boulevards in Bastia, with numerous larger shops and hotels. Although there are several beaches close to Bastia it is true that they are not as impressive as many you will find in Corsica. The best beach here is the Arinella Beach a few kilometres south of Bastia town centre, which is a long sandy beach with many activities available or follow the coast north from Bastia to discover several small pebble beaches such as Minelli Beach. 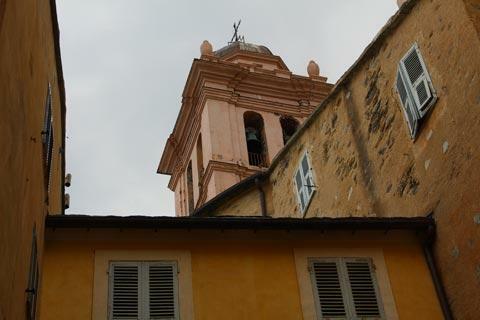 A short stroll from Bastia is the Chapel Notre Dame de Montserato. The chapel was built in the early 19th century and is quite unassuming on the outside but very impressively decorated inside. In an enviable position even further up the hill above Bastia is the small village of Cardo, a historical village that has lovely views back across the town below. The main activity outside the town for visitors is to make a tour of Cap Corse. This coast road is about 125 kilometres long and has access to several very picturesque beaches and villages as well as attractive coast scenery.